If you are looking for promotional advertising ideas that cost nothing, this is for you. Without spending money on advertising, it is possible to reach your best prospects on NBC or CNN or any other website in the world. And as I said, without spending a penny. This system leverages free banner ads. It’s very simple and I’m going to show you how it works. Your free ad will show up at the bottom right corner of the screen. It doesn’t matter which website your prospects are visiting. They will see your message. Your ad can say whatever you like, and when your prospects click it, they arrive on the webpage of your choice. The system is called a browser notification, and it selectively reaches only your best prospects… those who are most likely to do business with you, and it can even be past customers that you’d simply like to stay in touch with. In fact, I suggest you use this strategy on an ongoing basis to cultivate relationships with your prospects and customers and to stay in touch so the relationship doesn’t grow cold. And besides the benefits of cultivating relationships with your best prospects, there is another reason you shouldn’t ignore this strategy… A study by Kissmetrics showed that a full 96% of all site visitors are not ready to do business. And since they are not ready to buy, most first time visitors to your site will not fill out your contact-us form and neither will they pick up the phone and call you. They will just leave. And if they leave without contacting you, only a small percentage of those prospects who come back. So most of the expense and hard work you did to get them to your website in the first place, is wasted. They are gone, along with your opportunity to make the sale. Promotional advertising costs a fortune. You don’t need more ideas. You need smarter ideas! Save your money and use browser notifications. They cost nothing. 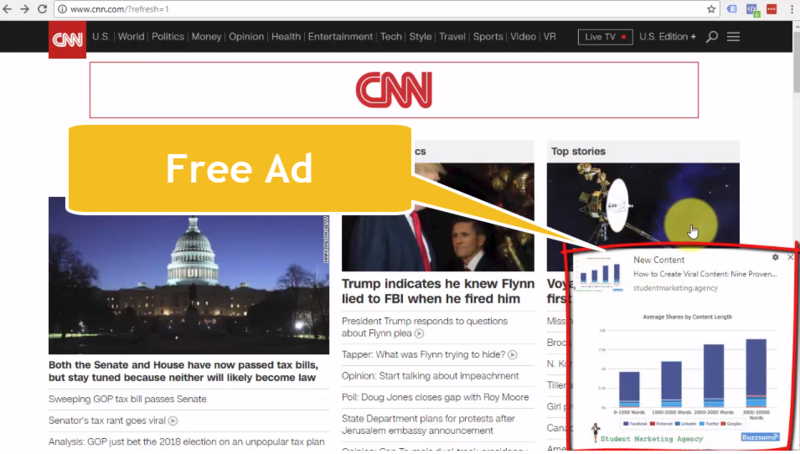 Browser notification system allows you to place banner ads for free, on any website the prospect happens to like surfing. Even still, people who have already visited your website are far better prospects than a cold audience. People prefer to do business with people they know because we tend to lean towards that which we are familiar with, and so the more engagement you can create between you and your prospects, the more glue there will be in the relationship, and the more likely it will be that you will get that first sale, as well as ongoing transactions. You don’t need their email address or any other contact information for the browser notification strategy to work. All need is for them to click a button when they visit your site and you can prompt them to do this automatically. There is some configuration and a bit of code that needs to be installed on your website. But once it is there, any prospect or customer who visits your website will see an automatic prompt on their screen, which asks them if they’d like to receive information from you. And you can customize what this prompt says to maximize the enticement. All they need to do is click the Allow button, and from that moment on, you can advertise to them for free, as often as you want, on any website in the world. Clicking a button is far easier than entering their contact information in a form. And there is almost zero perception of risk because they are not forced to disclose their identity. And that is why this works so well. And even sending the messages is simple. For example, let’s say you wanted to promote your latest blog article… it’s possible to configure this in such a way that the simple act of publishing, or even updating your blog article will automatically trigger the promotional message. This system allows you to advertise to your best prospects for free, pulling them back to your site and giving you another chance to sell them something, or even just add glue to the relationship so when they are ready to buy, they lean in your direction. If you are technical, you can do this yourself. The service I suggest is OneSignal. It is free to use. If you are an existing client, you can get access to our students immediately. If you use WordPress, we can have you up and running on this promotional advertising system in about three or four hours. If you are not on WordPress it will take a bit longer. If you are not already a client of our small business marketing agency, you’ll need to schedule an appointment to see if our students are a good match for your business.